The television sponsor has become semi-mythical. He is remote and unseen, but omnipresent. Dramas, football games, and press conferences pause for a ""word"" from him. He ""makes possible"" concerts and public affairs broadcasts. His ""underwriting grants"" brings the viewer music festivals and classic films. Interviews with visiting statesmen are interrupted for him, to continue ""in a moment. ""Sponsorship is basic to American television. Even noncommercial television looks to it for survival. 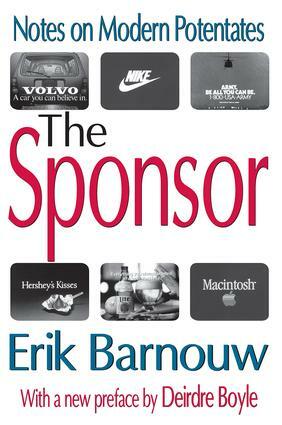 A vast industry has grown up around the needs and wishes of sponsors. Television's program formulas, business practices, and ratings have all evolved in ways to satisfy sponsor requirements. Indeed, he has become a potentate of our time.The Sponsor is divided into three parts. In ""Rise,"" Barnouw sketches the rise of the sponsor, in both radio and television, to his present state of eminence. In ""Domain,"" the sponsor's pervasive impact on television programming is examined, with an emphasis on network television, the primary arena of the industry. And in ""Prospect,"" Barnouw assesses what such dominance has meant for American society, mores, and institutions--and what it may mean for our future. This is a gripping volume about power, how it not only influences programming itself, but how it defines for the average person what is good, great, and desirable.